Not everyone can get to the IATA Annual Conference, so a mini version comes to us twice a year. This time our regional chapter meeting is right here at the Chippewa Moraine Visitor Center, just east of New Auburn. Various topics are on the agenda starting at 10 AM and running until about 2, after which we'll take a hike. Lunch is being provided by our chapter (thanks, Donna, Carol, Jane, & Pat). We'll learn what's new at IATA, discuss common chapter concerns, share great ideas about what's worked elsewhere, and get to know trail-hands from our neighboring chapters and IATA staff members. And we'll have some surprises as well. You can even do a little holiday shopping at the Visitor Center while you're here: shirts, atlas and companion guides, new IATA patches, IAT mugs, and more. The gorgeous book, Along Wisconsin's Ice Age Trail, is also available (at a fantastic member price) and would make a great gift for the trail lover! Please let us know if you plan to come so we can be sure we have enough food and seating. Just email to chapter@iatchippewa.org. More information, agenda, etc. is available at our web site here. So to recap: free lunch, shopping gets done, be with great people, learn interesting stuff, take a great hike. What's not to like? Thanks to Nancy and Tony Schuster and Jerry Sazama for helping to spread the joy of knowledge about the Ice Age Trail to outdoors enthusiasts at the recent Midwest Outdoor Adventure Expo in Minneapolis. It was a light day, but lots of good contacts. The dates for the ever-popular evening snowshoe hikes at the Chippewa Moraine Visitor Center are Friday, Jan. 29 and Saturday, Feb. 27. An introductory program begins at 6:30 PM and the hike follows at 7. Snowshoes are available at the center, but you need to reserve them ahead by calling 715 967-2800. 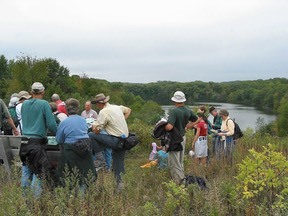 The hike takes place regardless of the weather, led by reserve naturalist Rod Gont. While your calendars are out, also note that our annual meeting is scheduled for 6 PM Monday, January 18, at the Chippewa Falls Public Library. We're working on a special treat we'll just call "The Bridges of Chippewa County". Our Twitter editor reminds you that our chapter will occasionally grace your twitter "timeline" if you go to our page at www.twitter.com/iatachippewa and click on "Follow". We send "tweets" from time to time to remind followers of meetings, hikes, events, etc. as well as important changes (cancellations, etc.) and new items on the web site. If you've scoffed at the idea of twitter in the past because you thought it was about what kind of cheese was on someone's sandwich, take another look. It's become a great tool for getting "headlines" about "What's Happening" from friends and groups like IATA that you want to know about. You can always "Unfollow" if we annoy you.